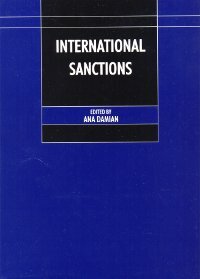 ﻿ International Sanctions - incentive or punishment? "The Stability Pact for South Eastern Europe is a European initiative whose objective from the outset was to lend material and moral support to those in the region - including Yugoslavia, which was as the time subjected to the sanctions of the international community - who were ready to speak and act in favour of approximation to the European standards. Under this initiative, the Szeged Process (and within its scope the Szeged Foundation, set up by the Government of the Republic of Hungary with the sole aim of encouraging democratic development in Yugoslavia) offered numerous possibilities for exposing the substance of the major crisis that affected the country and encouraged various segments of society to work actively toward overcoming the isolation. Democratic changes in Yugoslavia in the fall of 2000 created a radically different situation in which the people and entire society can build the foundations of a contemporary democracy, an open society. In the new circumstances the doors of the community of nations swung open before Yugoslavia, proving its readiness to jointly contribute to the stability of the region, to accept, develop and enrich the general values of the modern society in which there would be no place for totalitarianism, biased approach and disrespect of human rights."